Happy March. As our Club focuses on the last four months of our current Rotary year, we will be working on finishing up our current District Grant by installing our second Little Free Library, making decisions as to a new District Grant for next year, exploring a Global Grant possibility, getting ready for our major fundraiser - Canton Liberty Fest Beverage Tent, and enjoying our year end celebration - District Conference at Caesars' Casino Windsor. When supporting service projects in a developing community, purchase goods and supplies locally to stimulatge the economy and avoid unnecessary shipping fees. Establish a Rotary Community Corps (RCC) and empower members to take action. RCC members are in a unique position to identify barriers to the community's economic progress and develop sustainable solutions. Partner with a local microlender to improve access to financial services and provide financial infrastructure in the community. Develop mobile banking resources in partnership with a microlender. Cell phones, which can be used to make deposits and transfer funds, can increase access to banking systems in developing communities. Send a Vocational Training Team to teach business leaders in developing communities how to create a business plan and maintain accurate financial accounting. Partner with a cooperative that provides training, joint economic ventures, and ownership of assets to its members through a democratic structure. Expand vocational training opportunities, including job placement programming, at local nonprofit organizations. Today 190 million people are funding their business endeavors through microfinance. And 1.4 billion people - nearly half of them employed - live on less than $1.25 a day. We met today at the L A Bistro with Peace Officers Lt. Mike Kennedy and Patty Esselink of Canton and Linda Searles of the Thin Blue Line USA. March 5th - Fat Tuesday Dinner at the Belleville Rotary Club. March 9th is the "Dump and Donate" event at Achieve Charter Academy. Please see Sarah if you have more questions or want to coordinate with her on the event. March 30th - Westland Club Magic Show. April 13th - Dearborn Heights Club Mardi Gras Party. Bill Brown had a follow up interview for his WWII service with CBS. Stay tuned and see this link if you missed the first one. District grant training is ongoing, starting this week. Please remember to register at the District 6400 web site if you plan to go. May 10th-12th is District Conference - Caesars Windsor for 2019. 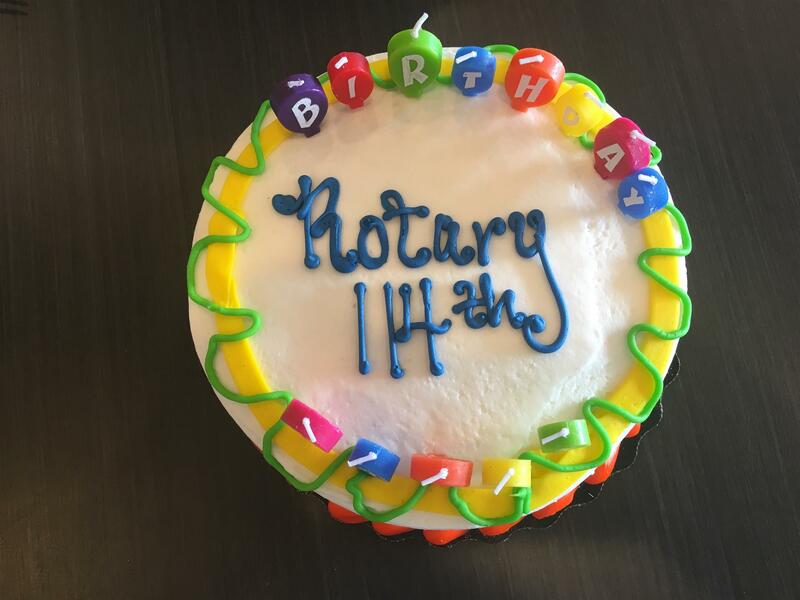 Rotary Cake Today! - Rotary is 114 years old. Linda Searles of the Thin Blue Line USA (a local Canton Business) opened the floor with a presentation on the history and development of the Thin Blue Line program for a lot of communities to support their local police officers and first responders. This also included the evolution of the U.S. based symbols, the physical reminders and tokens commonly used today from the arm band/logos to the very nice watch, and the supporting organizations such as COPS. We then heard from Lt. Mike Kennedy and Patty Esselink of the Police Department right here in Canton. 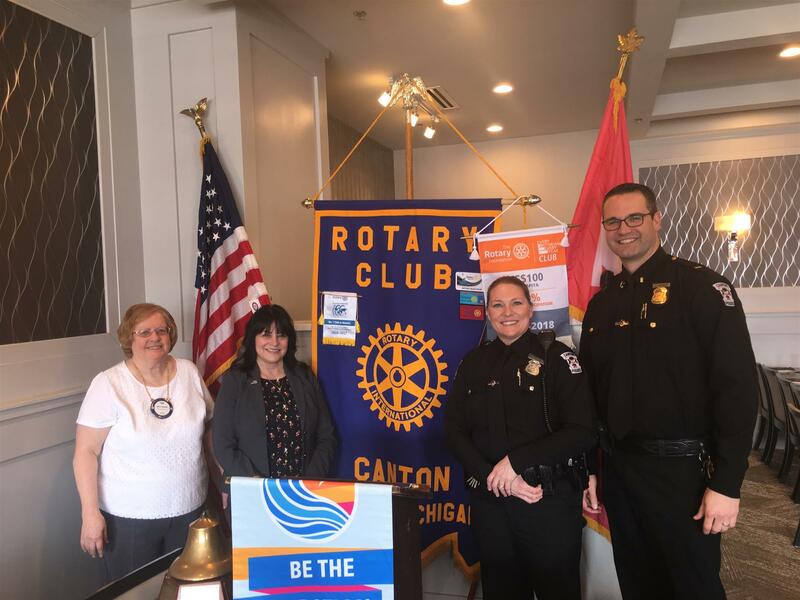 They discussed some of the support systems for the Police Department that included the Police Benevolence Fund, scholarships, charitable giving, events and awards in Canton, Police Week (coming up in May), and the "Canton Cares" program. They then fielded some good Q/A on the structure and education of new police officers here in the township. Here is a link for P.D. Canton and you may see some names and people you have met here in the past (not at the light or stop sign of course). Be safe and wise out there on the roads with the 4-way test everyone. Sgt. 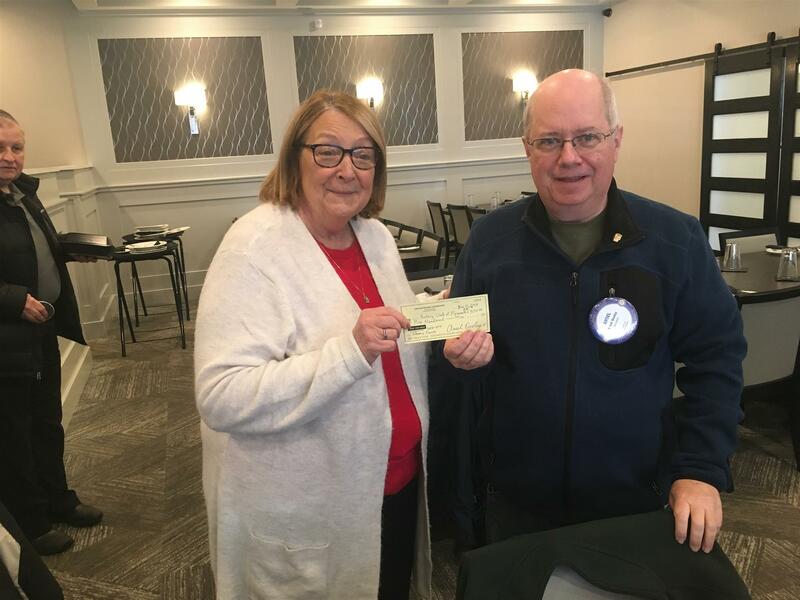 John Kowalski took good notice of the club today and leveled a fair $1 fine with good Rotary trivia today for it's birthday (lunch followed with cake for desert treat). 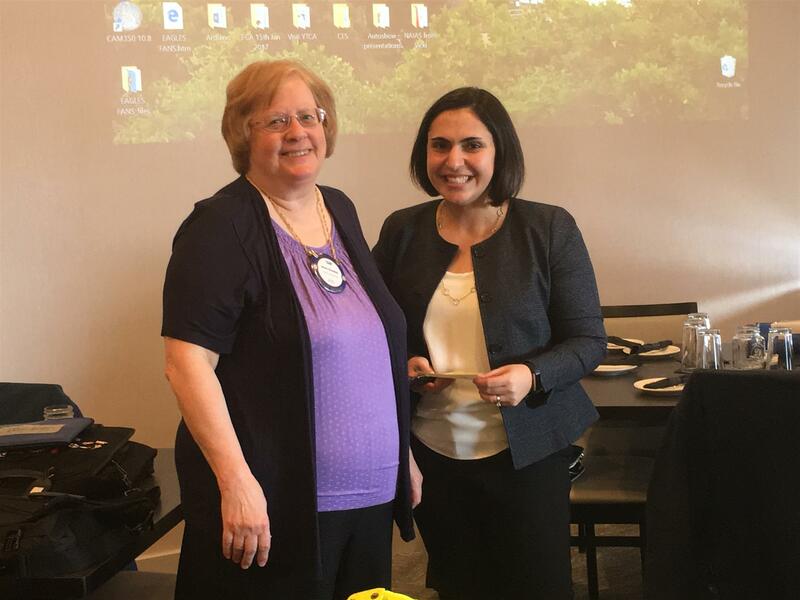 We had a visit by President Rosa Bushkhal and Alan Cooper from the Society of Women Engineers Detroit as our speakers today. President Sue Kowalski started our meeting on time once again. We were pleased to have DG Paul Sincock in our attendance today and he gave us an update of the District Conference plans for Caesars Windsor for 2019. Mark your calendars for May 10th-12th. The United Way is working with the Rotary on "Backpacks for Success" to support local schools in Windsor-Essex. Please see the flyer for levels of proposed support. 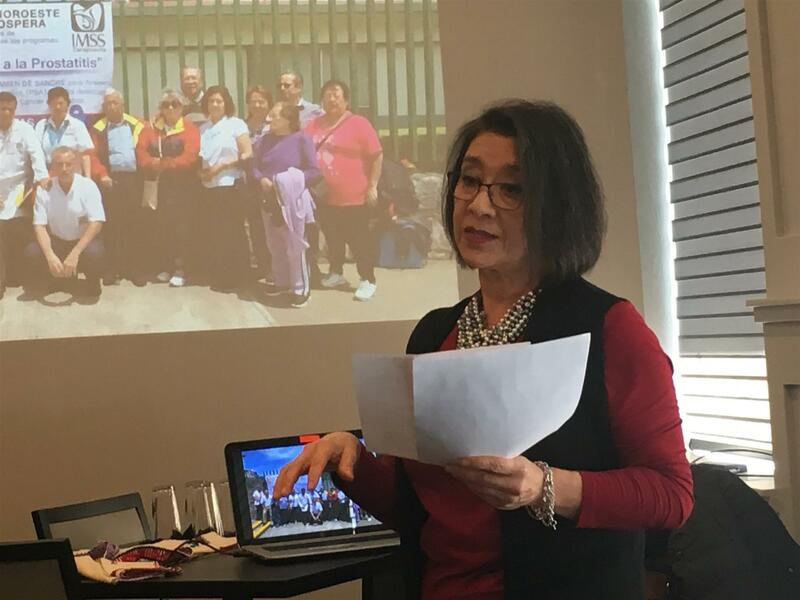 President Rosa addressed the club today with a multimedia presentation that illustrated the background and current activities in SWE Detroit. 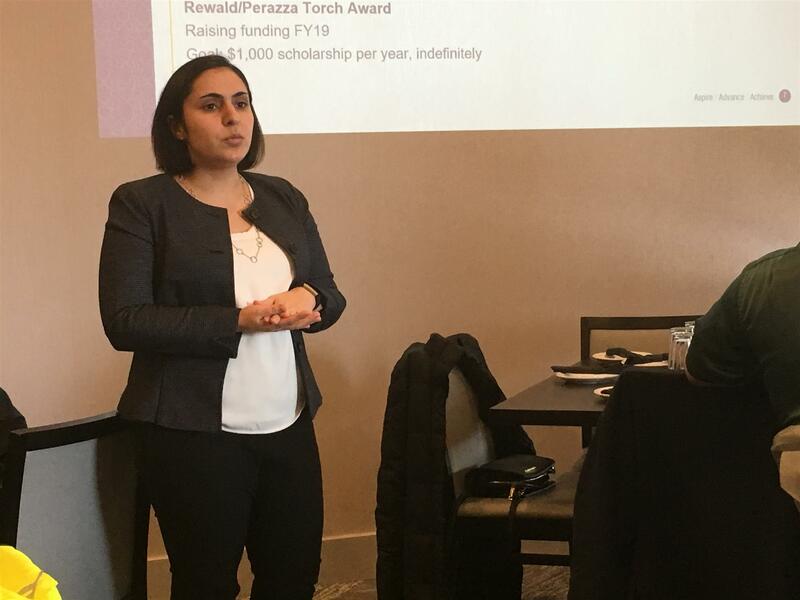 This included an update on their membership, key events and initiatives for 2019, "Girls Engineering Exploration Day", an overview of the professional development committee, and a review of their endowment scholarships. 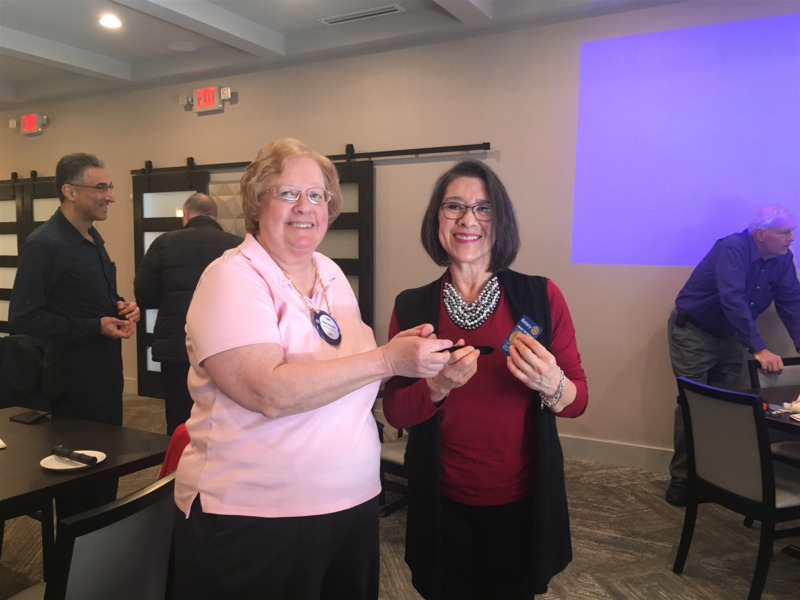 The club thanked her for updating us on the activities there and Rotary Club President Susan Kowalski presented her with a $500 donation to SWE Detroit for 2019. 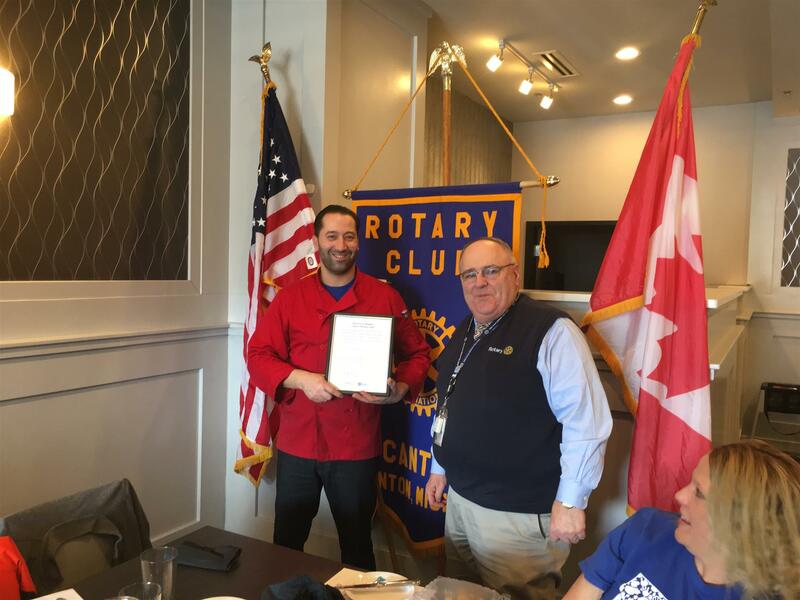 Our District Governor, Paul Sincock, also installed L A Bistro owner Souheil Johair as an honorary member of The Canton Rotary Club. 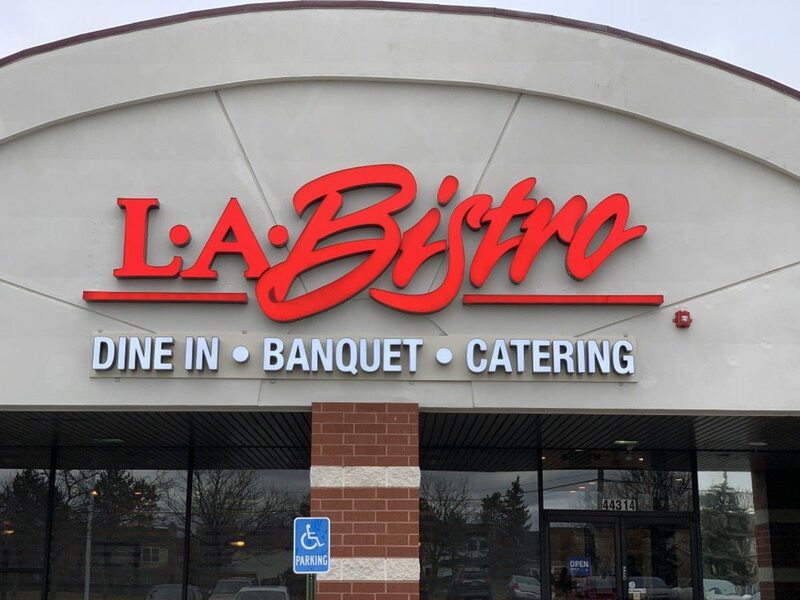 As a Club we are happy to have found a new home at L A Bistro and look forward each Monday to their hospitality and good food. Ken was our Sergeant today and he presided over a $2 tax for the best story. Our previous visiting Exchange student also won the opportunity to go for the 50/50 grand prize, but elected to take the default prize and maybe avoid possible EU taxation on his return. 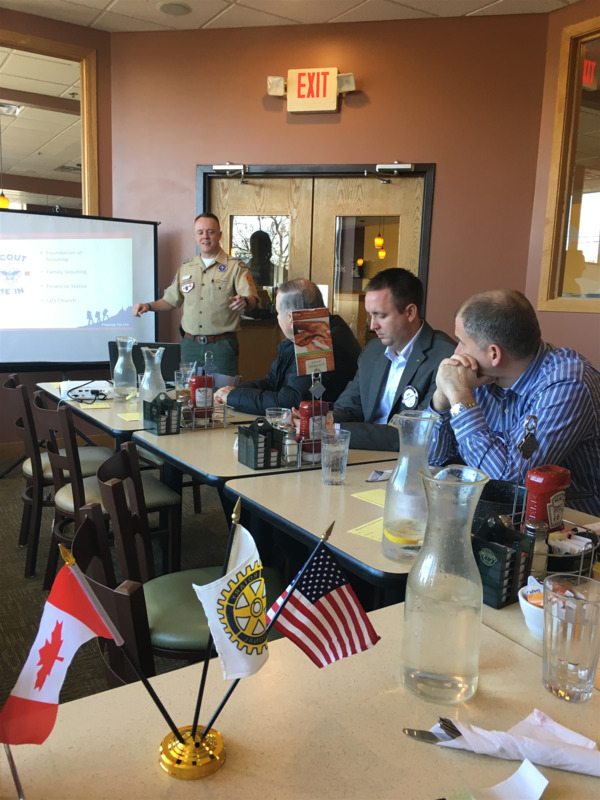 We met today at the L A Bistro and heard an update on the Boy Scouts and Eagle Scouts by fellow Rotarian Charles Lang. 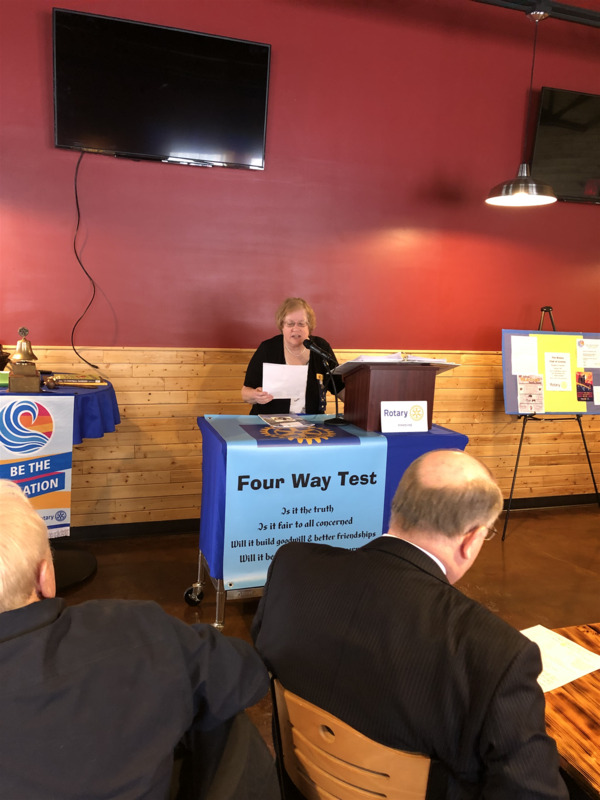 President Sue Kowalski started our meeting on time and we settled in to the new home of the Canton Rotary Club. The following link is active for the "Dump and Donate" event on March 9th. Check out the details at the link. Feb. 16th is our 5th annual Youth Exchange Bowling event from 12:00 pm - 4:00 pm at Plymouth Plaza Lanes. Members are encouraged to attend. Save a spot in your Winter weekend for some easy going bowling, pizza, and fun. Please see John K. or Ansel if you need some info. We are hoping to have no snow this time. We had a quorum today and confirmed the following Board of Directors for the Canton Foundation: Ken, Bill B., Bill S., Larry, Ansel, Sarah, and John K.
Bill Brown may have a follow up interview for his WWII service with CBS. See this link if you missed the first one. It was very well done and on Eye on Detroit (CBS). The Salvation army bell ringing we did this winter netted $485 for the work of the Salvation Army. Thank you for setting this up Lisa. Charles Lang gave the club an update on the Boy and Eagle Scouts and the club presented him a check for $600 to support six Canton Eagle Scouts at the Building Character Dinner which is a Recognition and Mentor Dinner on Feb. 26th to recognize those youth who have achieved the rank of Eagle Scout, Summit or Quartermaster. More information and even registration is here. 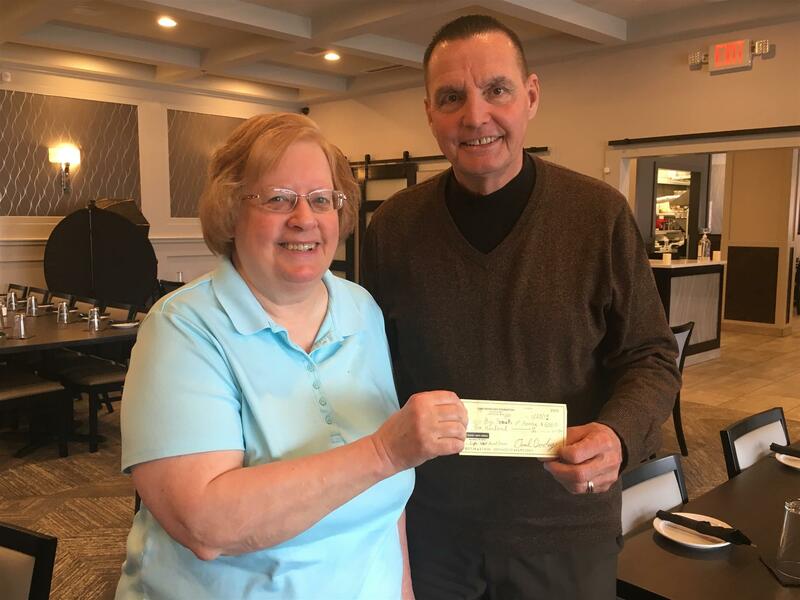 We met today for a night social at the LA Bistro and chatted with Sarah Maiga about a new planned local fundraiser called "Dump and Donate"
President Sue Kowalski started our evening meeting at the new LA Bistro in Canton (off of Cherry Hill Rd. and Sheldon Rd. on the N.E. corner). This evening we also got to try out the dinner menu. Sarah filled us in on some of the new plans for the Dump and Donate event scheduled for March 9th. A link to a new Youtube video she has prepared is here, and the club voted tonight to offer support for the activity. We also then discussed some other planning and logistics as opportunities to help out. No formal speaker here today, but for other side notes, we will be adjusting the dues and are liking the new venue here a lot. Pat Williams forwarded a thank you note for the food donation to the B.L.O.C.K. on December 17th (leftovers from Panera carryout lunch). We tentatively have been selected for the Beer tent again for this year so the club is certainly pleased to be working with the City of Canton and the Optimist Club again in 2019 to support Liberty Fest. And, Bill Tesen displayed a nice plaque honoring Bill Brown's wife Mildred to be placed one of the new trees in Heritage Park this year. Also keep your eyes out for a possible Broadcast by Bill Brown on WWJ Channel 62 possibly in the near future. Today we met at the Scrambler in Canton Michigan and our Guest Speaker was Janssen Lemley of the Scouts. Our next meeting on Jan 21st is planned to be at the new Canton L.A. Bistro. The link will take you to their facebook page for maps,features, and menus. Bigger back room and new Italian eats. Feb. 16th is our 5th Youth Exchange Bowling event from 12:00 pm - 4:00 pm at Plymouth Plaza Lanes. Members are certainly welcome. Save a spot in your Winter weekend for some easy going bowling, pizza, and fun. Please see John K. or Ansel if you need some info. Please keep May 10th-12th of 2019 on your Radar - The Next District Conference is in Windsor at Caesars - Friday (night) / Saturday / return Sunday. Again at popular request this is super affordable for 2 at $1050 for this location right across the Detroit river in Windsor. Again, note our 2019-2020 Board is Lisa Kennedy (President), Sue Kowalski (Treasurer), Bill Tesen (Secretary), Marlette Anquetil (Director), Nathaniel Houghton (Director), Dean Clemons (Director), and Sarah Maiga (Director). Our nominations for the Canton Foundation for 2019-2020 are: Ken, Ansel, Bill B., Bill S. Larry O., John K. and Sarah. Our current president Ken Beardsley is planning a quick info meeting next week after the Rotary Club meeting, so Foundation members please be ready for stay for a few minutes. Our guest speaker today was Janssen Lemley, the Field Director of the Boy Scouts Michigan Crossroads Council. 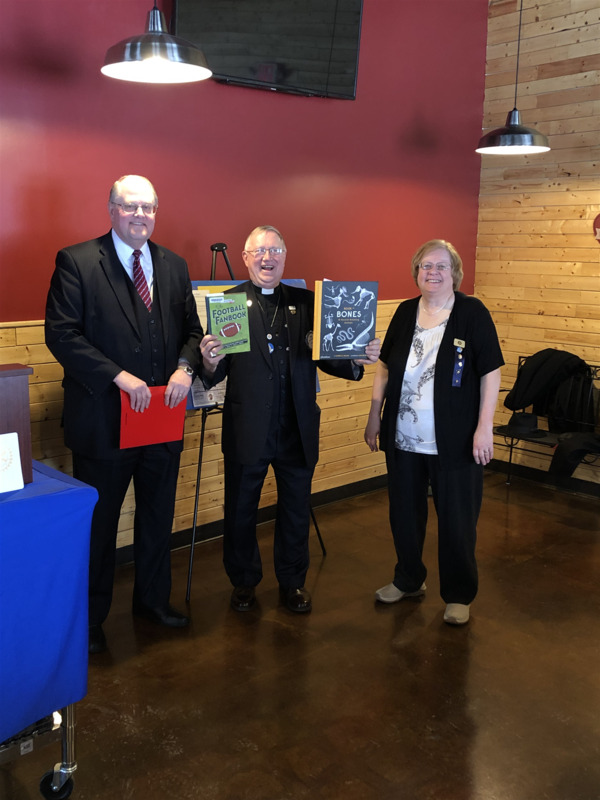 He gave the club a very visual multimedia presentation today such as the Foundations of Scouting including the mission (same as back in 1914), family status and changes there, and LDS (Latter Day Saints) association changes for 2019. 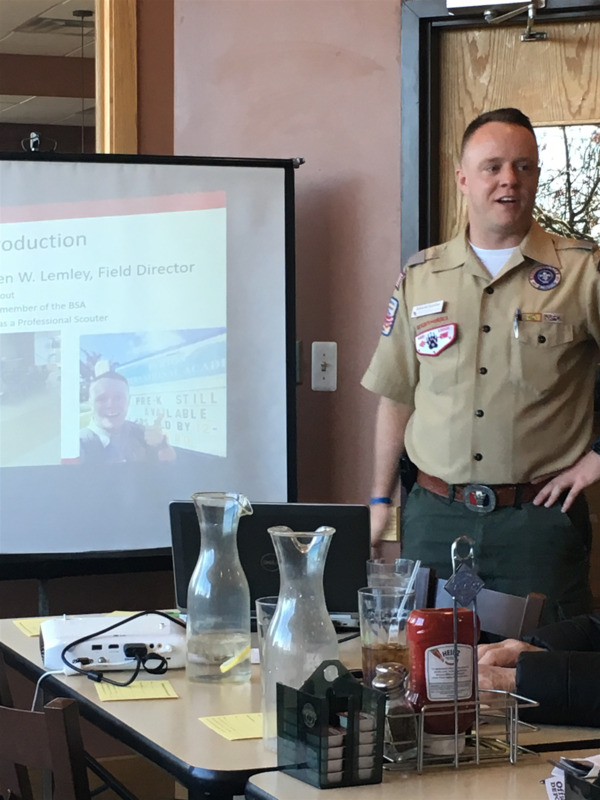 He also reviewed the 12 principles of Scout Law, aims of Scouting (3 examples), a review of the 4 major programs, practical requirements of Scouting, and a breakdown of the Michigan and local organization down to practical considerations for today's local and family driven Packs and Dens. We thanked Janssen for coming to speak to us today and certainly hope he will join us for an easy lunch and conversation in the near future. No win on the 50/50 for lucky Ken, but the jackpot will be bigger next week. Today we met at Mexican Fiesta Restaurant for a casual evening meeting in Canton off Ford Rd. Jan. 14th, our next meeting is at Scramblers. 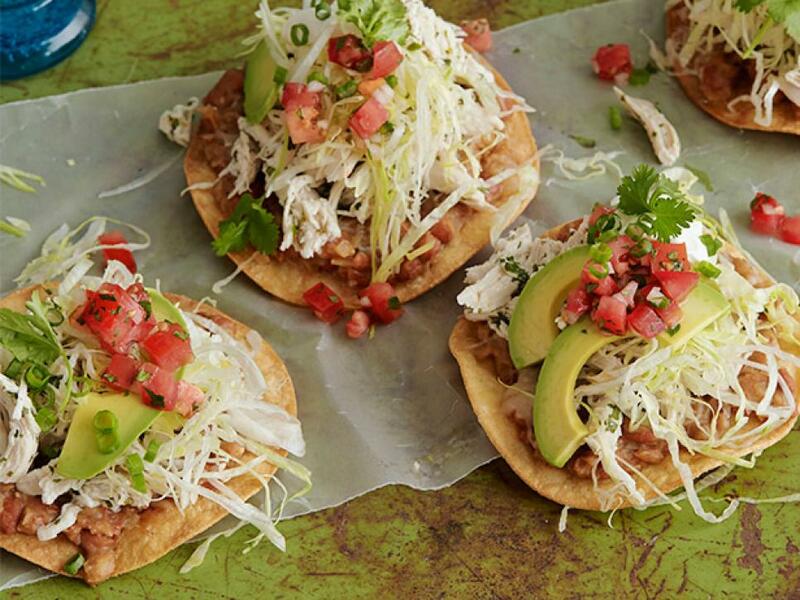 Check'em out, good food and variety. Feb. 16th is our 5th Youth Exchange Bowling event from 12:00 pm - 4:00 pm at Plymouth Plaza Lanes. Members are certainly welcome. Save a spot in your Winter weekend for some easy going bowling, pizza, and fun. Please keep the May 10th-12th of 2019 on your Radar - The Next District Conference is in Windsor at Caesars - Friday (night) / Saturday / return Sunday. Again at popular request this is super affordable for 2 at $1050 for this location right across the Detroit river in Windsor. Please consider our next road trip with other clubs in our area. Perhaps Northville and Garden City (see John K.) or Livonia for a Dual meeting maybe at Zukins BBQ (see Sue K.). Plans are in the works. Have a good week everyone and enjoy this mild break from the normally snowy Michigan winter. Gratitude matters.